This is a guest post by Zhang Huan, an environmental editor for Sina's news channel. Taiwan is to hold a referendum to resolve a 20-year argument over construction of a fourth nuclear power station, with many having deep reservations about nuclear development on the island and hoping the outcome will kill the project. Taiwan’s three nuclear plants, and the fourth, half-built power station, are all around 30 kilometres from the capital Taipei. The first was built 28 kilometres away, the second 22 kilometres. The fourth is under construction around 30 kilometres from the city. Tao Guangyuan, executive director of the Sino-German Renewable Energy Cooperation Centre, says such close proximity is shocking. To build three nuclear power stations that close to a city of millions of people is putting money before safety, Tao says. Worse still, Taiwan is prone to earthquakes. The chances of an earthquake or nuclear accident are very small, but Tao does not believe this justifies Taiwan’s nuclear development strategy. The three biggest nuclear accidents the world has seen were all disasters that “couldn’t happen”. Japan thought a magnitude nine earthquake was off the cards – then there was Fukushima. Their safety measures were inadequate and the result was tragedy. The world has 400-plus nuclear plants, and has seen three major accidents within a few decades. However you calculate the odds, they aren’t small, says Tao. Taiwan has a land area of only 35,800 square kilometres: one accident could turn half the island into a no man’s land. Financial costs are also high. Former president Chen Shui-bian ordered a halt to work on the fourth plant, then decided to allow work to continue, according to the overseas edition of the People’s Daily. Due to the delays, costs rocketed. 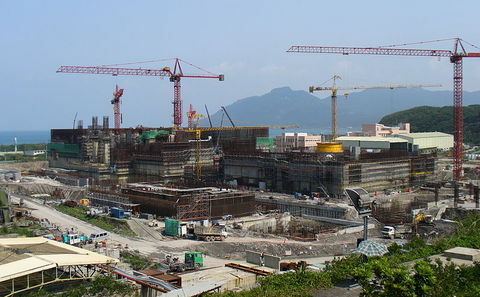 At current progress and budgets, it is set to be the world’s costliest nuclear power plant. February’s announcement that there would be a referendum to decide the future of the controversial plant reverberated through Taiwan, and is bound to become a part of the struggle between the island’s two main political parties. The Democratic Progressive Party (DPP) has already hoisted the anti-nuclear flag, with chairman Su Tseng-chang describing the position as being in line with popular opinion. Meanwhile Lai Shyh-bao, caucus whip for ruling party the KMT, said his party welcomed the fight and would make sure the budget for the plant was passed. Speaking on March 14, president Ma Ying-jeou gave his backing to the referendum, saying that allowing the people to decide on this issue was unprecedented, but the only way to get the entire population involved in the issue, reported Taiwan’s Central News Agency. However, premier Jiang Yi-huah said that he did not wish to see a populist debate over the matter, pointing out that it was not possible to meet calls for the cheapest electricity in the world, halt nuclear power and coal burning without imposing lifestyle changes. Tao Guangyuan said Taiwan has better options than nuclear, including ample solar power potential in the south-west. The Taiwan Straits are very windy and in many places less than 50 metres deep, making this a good spot for offshore wind development. Natural gas can also be imported, Tao said. In Taiwan – as in so many parts of the world – the push for nuclear power is not just about energy. In Tao’s view, the Taiwanese government supports nuclear power for two reasons: one, the nuclear lobby is stronger than that for wind or solar. And two, it is influenced by the US and Japan, which help fund its purchases of American reactors.